If you’ve ever wanted to see dolphins up close in their natural habitat, the beach at Monkey Mia Reserve is the place to go. The stunning waters of Shark Bay Marine Park are home to a diverse population of animal species, from dugongs to loggerhead turtles, but it’s the dolphins that visit Monkey Mia nearly every morning that draw more than 100,000 visitors to the beach each year – there’s really nothing else in the world like it. This guide will cover everything you need to know about the Monkey Mia dolphins and how you can take part in this unique wildlife experience. Dolphins haven’t always been visiting the shores of Monkey Mia. The tradition dates back to the 1960s when a fisherman and his wife began to feed them part of their catch. Slowly but surely, they gained the dolphins’ trust, and the dolphins have been swimming up to the shore ever since! The phenomenon hasn’t just attracted tourists to the area – marine biologists have also taken interest in the resort’s dolphin population, leading to the start of the Monkey Mia Dolphin research project in 1982. Today, dolphin feedings are much more carefully supervised than they were in the 1960s. 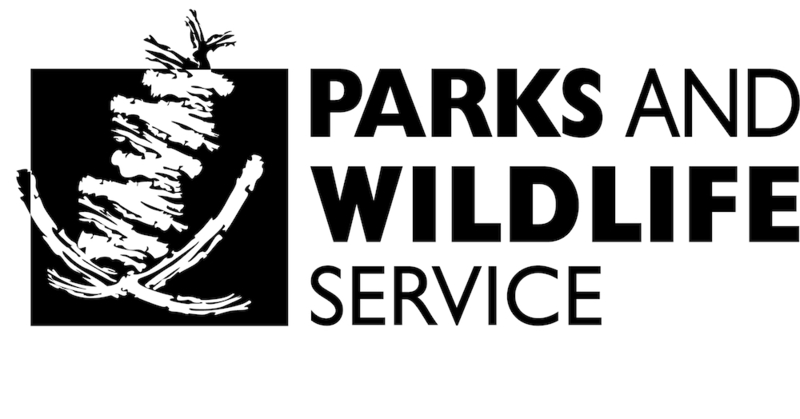 Park rangers are present to make sure that their natural hunting behaviours are not altered in any way. They keep a careful record of which dolphins are fed, when they’re fed, and how much they’re fed. The Shark Bay World Heritage Area is home to more than 2,000 dolphins of the Indo-Pacific bottlenose species. These dolphins are a sub-species of the common bottlenose dolphin. Two-hundred of these dolphins live in Monkey Mia, and while many of them visit the shore, only five adult females are fed by humans – park rangers can identify each one by its unique fin shape. Despite interacting with humans regularly, the dolphins of Monkey Mia are still wild, making it one of the only dolphin experiences in Australia where you can see dolphins behaving naturally. They’re only fed a small portion of their daily diet (10%) so that they’re not discouraged from hunting, socialising with other dolphins, or doing any of their other normal behaviours. It’s rare to interact with dolphins in their natural habitat, so standing in the shallows to feed one of these beautiful creatures is something you’ll never forget. The following is everything you need to know about the dolphin experience at Monkey Mia. What happens at a dolphin experience? The dolphin experience begins at the Monkey Mia Visitors Centre with a short brief by a local park ranger at 7:45 am. When the dolphins are ready it’s time to get in the water – you’ll wade ankle-deep into the shallows as the dolphins approach, some of them coming as close as a few meters from where you’re standing. The ranger will explain how the dolphins are fed and choose a few people from the crowd to come forward and give a dolphin a fish. When do the feedings take place? Dolphin feedings take place up to three timesbetween 7:45 am and 12:00 pm every day on the beach at Monkey Mia. The dolphins don’t have set feeding times, so the exact time they appear varies from day to day. Days when no dolphins appear are extremely rare – the reserve has a 99% dolphin attendance rate year-round! The first feeding is the most crowded, so it’s recommended you arrive early to get a good view. But don’t be discouraged if you sleep in and miss a feeding – the dolphins can be fed up to three times per day, so they usually come back for seconds and thirds! The current entry fees for Monkey Mia can be found here, but there is no additional fee to participate in the dolphin feedings. The flat fee is charged by the Parks and Wildlife Service so the money goes directly to managing the Monkey Mia dolphin experience for the benefit of both dolphins and visitors. At Monkey Mia, the health and safety of the local wildlife is our top priority. Visitors are expected to behave respectfully and follow instructions from the Monkey Mia rangers. This ensures that everyone – humans and dolphins alike – has a positive and safe experience. Keep your hands to yourself. It may be tempting to reach out and pet a dolphin, especially if you’ve been chosen to feed one. Not only is this dangerous for the dolphin (humans can transmit diseases to dolphins, and vice versa), but they might mistake your hand for a tasty fish! It’s actually illegal to approach a dolphin within 30 metres outside the experience area, but if a dolphin happens to approach you while you’re swimming, just remain still and enjoy the experience! Swimming, boating, and fishing are not allowed in the dolphin experience area. This is so that the dolphins can visit the shore without any human disturbances and so that researchers can freely monitor the pod. 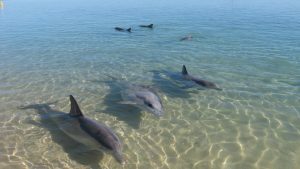 The dolphins of Monkey Mia are more than just a tourist attraction – they provide wildlife researchers an important window into dolphin behaviour. You’ll learn a lot about these gorgeous creatures from the park rangers who supervise feedings, and you can learn even more about the dolphins and other local wildlife from the interpretive signs around Monkey Mia. So when you visit the beach, you aren’t just getting a one-of-a-kind experience – you’re also helping to support one of the largest non-invasive dolphin research sites in the world. Still can’t get enough of these amazing creatures? Then consider becoming a volunteer at Monkey Mia Reserve. You’ll get to assist park rangers with feedings, help keep the beachfront looking beautiful, and work with researchers to collect wildlife data. The minimum amount of time that you can volunteer is four days, and the maximum is two weeks. Because shifts are early and short, many people plan to volunteer during their holidays. You’ll get to spend your mornings helping dolphins and your afternoons relaxing on the beach or exploring the local flora and fauna. Shark Bay is an animal lover’s paradise – from the dolphins of Monkey Mia to the endangered bird species that nest in Francois Peron National Park, you’ll never run out of wildlife to see or things to do. For more information about Shark Bay visit our website or contact the Parks and Wildlife by calling (08) 9948 2226. This entry was posted in Wildlife news. Bookmark the permalink.